Thanks to Udon for providing me with this advance copy of the book. If the scheduled date is correct, this book is coming out in Jan 2013. But since I already have this book in hand, it might be released earlier. 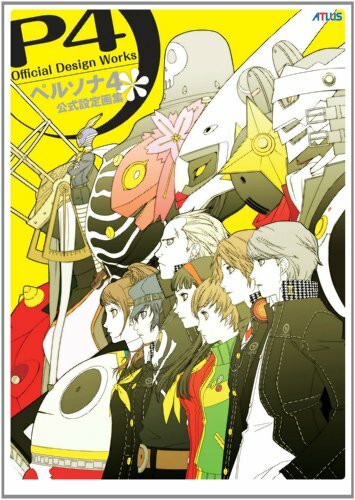 This is the English translated edition of ペルソナ4 公式設定画集 that I already have. There are some slight differences. The English book is A4 size, slightly larger than the Japanese book, and there's no dust jacket. I'll just duplicate the review of the Japanese book below. According to Udon, the 2013 release date marked up on Amazon is a mistake - they don't know why Amazon have it marked up like that. It should be coming out around the middle of August, just after the Disgaea Art Book. They have them dressed in womens clothes as later in the game they have a school show, in which one of the attractions is a cross dressing contest :P. Thanks for doing all these reviews, definitely helpful in choosing christmas presents.